For the longest time, I just didn’t do it. I don’t do fiddly food. I don’t ice biscuits, don’t roll fondant, don’t twiddle with decorations. I could say that’s because I’m a generous, hearty, rustic kind of cook – but really it’s because I lack the patient dedication and the skill that go into craftsmanlike work. I have no aptitude for the fine arts. Long story short: I didn’t want to make a bread basket. 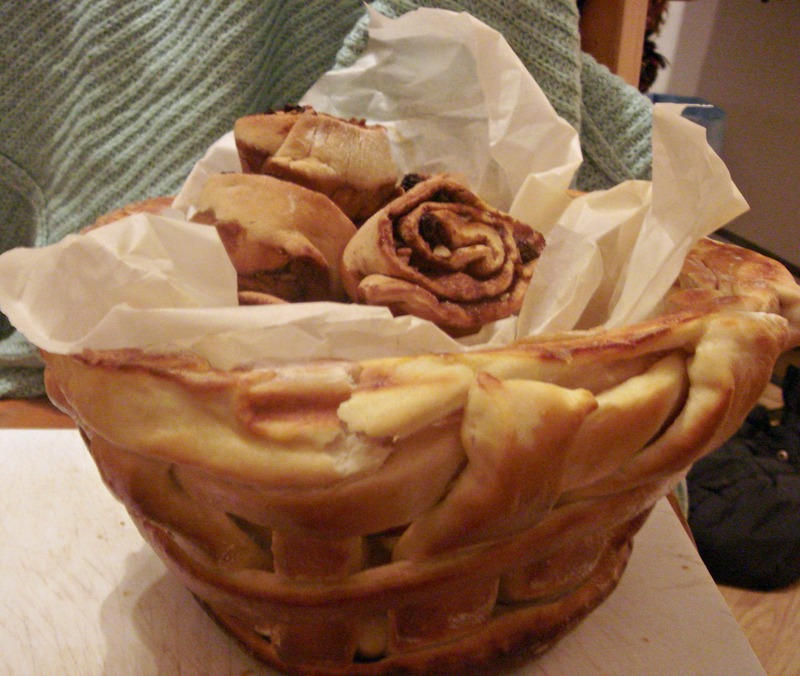 By which I mean an actual basket, woven out of bread dough, and baked. Do I weave? Do I ‘eck. Etc etc. The basket was meant to hold 24 rolls – two types, 12 sweet and 12 savoury. This didn’t actually faze me at all. It was the weaving that put me off for a while. And then I reasoned that the whole idea of setting myself a ‘baking challenge’ was that it should be a…challenge. And yet, when I actually did it, it was…not easy, exactly, and I won’t claim I’ve done it since, just for fun, but something about making that basket from raw bread dough was logical and came together. Because of the yeast, bread dough properly proven has a bit of a spring to it, so sometimes the rolled-out dough strips bounces back a little, which isn’t the most fun in the world. And, although I had a recipe and instructions in front of me, at one point I had to forget careful and structured overlapping and just went for something that held together. In the end, however, I was rewarded with something I really thought I could never bake and that was beyond my structural abilities. The basket wasn’t picture-perfect but, unlike some of the contestants’ it stood upright and held the bread rolls (although it could only hold one batch at a time). 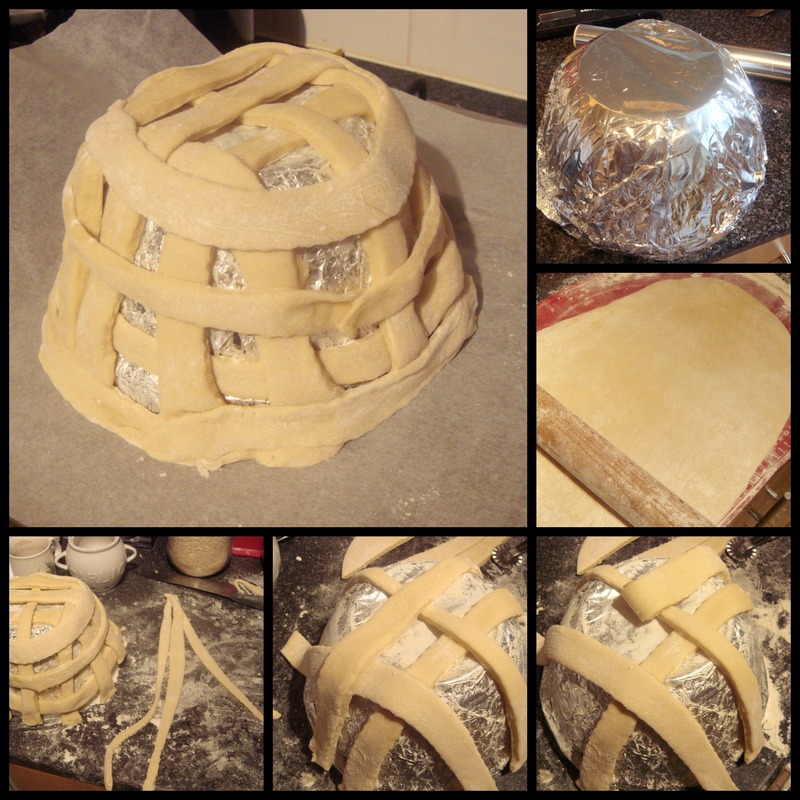 How to make a bread basket: cover your mould; roll out the dough; lay out your strips. You will get there! Oh, and the contents? Black Forest ham and cheese rolls from Dan Lepard, which were sturdy and hearty – the kind of warm, filling food which would make a hearty addition to a picnic (it can be cold if you picnic in the first flush of early spring enthusiasm) or a complementary side to cabbage soup. The rye gives them not only heft but a little smokey depth which I like. And for the sweet, Baba a Louis Sticky Buns from Diana Henry’s Roast Figs Sugar Snow, which sadly disappointed me – they were a little too vrunchy and the sugar caramelised hard rather than remaining gooey as promised. It may have been user error – my oven could have been running hot, for example – so I have included the recipe for reference below. I used a recipe from BBC Good Food, but doubled it, and the method from Artisan Bread in Five, which has great step-by-step images, and then winged it a little. Top tip: make sure your surfaces are as clear and tidy as possible before embarking on this. You will also need a heatproof bowl of some kind to form the frame for the basket. The recipes I based this on both suggest a metal bowl. I used a ceramic pudding bowl flipped upside-down, which I wrapped in foil then greased with butter. Combine the flour, yeast, sugar and salt and mix to combine. Gradually add the water and one of the beaten eggs, mixing together until thoroughly combined. Add melted butter and mix it in until completely incorporated. On a lightly floured surface, knead the dough for about 10 minutes until smooth and elastic. I kneaded it until it could form a windowpane. I did this to ensure the dough was sufficiently robust to be able to stand up. Return the dough to the bowl and cover with some loose clingfilm or a damp tea towel. Let rise until doubled in size, at least 30 minutes, but it could be an hour or more. I let mine prove for about 45 minutes. On a lightly floured surface, punch the dough down and shape into a round ball. Let rise for about ten minutes further, again loosely covered. Divide the dough roughly into two balls of equivalent size. Roll out to a 15x30cm rectangle. Using a sharp knife, pizza wheel, or pasta cutter, cut the dough into strips about 2.5cm wide. Take your heatproof bowl and grease it with some butter if you haven’t already done so. Preheat your oven to 200C. Drape the strips over the bowl, trying to keep them evenly spaced. I found it much easier to work a few strips at a time, because the incline of my bowl was quite steep, but this meant achieving a pretty lattice was harder. Fold every other strip over itself, then lay another dough strip over those that are still lying flat on the bowl. Unfold the strips over this new strip of dough and – ta-dah! Interwoven lattice! Continue doing this with the pieces that were not folded over last time. (See my above picture or please check out the Artisan Bread in 5 post, which has beautiful and clear photographs, if you are unclear about these steps. As mentioned, I ended up winging it a bit and gave up on interweaving after a while in the interests of Total Bowl Stability). Take a final strip of dough and place it around the edge of the basket. If you are having trouble keeping the pieces of dough adhered, use a little bit of water to seal together. Once done, gingerly transfer to a lined baking tray. Take your second egg, beat together and gently brush the egg wash over the dough strips. Take care not to let the egg wash drip down where it might cause the basket to stick to the lined sheet. Bake for 20 minutes, checking after 15 minutes in case it is browning too quickly. If so, cover loosely with foil. After the full baking time, do a careful check to ensure the basket seems cooked all over. It’s slightly more tricky than with other bread recipes because you can’t tap it to check if it’s hollow, but just ensure nothing seems too floppy or soggy. If it does, bake for an additional five minutes or so. Let the basket and dough cool down until you can handle it, then gently ease the bowl mould off what should now be a bread basket. Go slowly and if you think the dough will tear, just gently place the mould back and let it cool a little longer. You may want to bake the unmoulded bread basket for five more minutes in the oven if it seems too pale. Combine the two flours, yeast and salt in a mixing bowl. Fry the onion and caraway seeds in the butter until soft. Remove from the heat, stir in the water and beaten egg, and pour into the flour. Mix to a soft dough, ensuring that everything is well-combined and evenly distributed. Lightly oil a clean work surface. Put the flours, yeast and salt in a mixing bowl and toss together. Gently fry the onion and seeds in the butter until soft, then remove from the heat, stir in the water and egg, and pour into the flour. Mix to a soft, even dough. Give the dough three light kneads on an oiled surface, spaced 10 minutes apart, then leave to rise for 30 minutes. 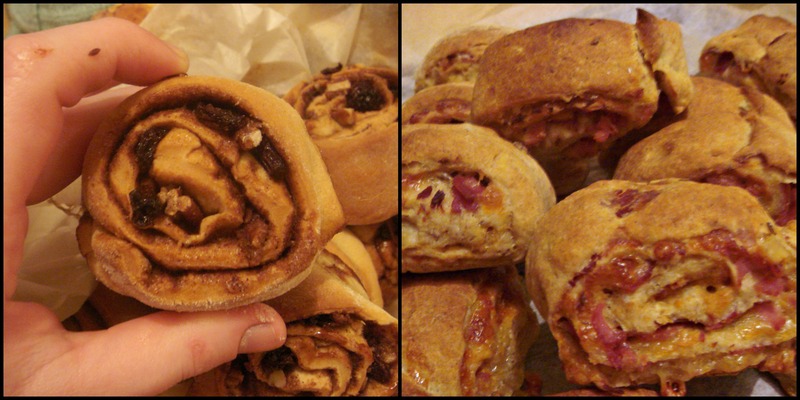 Roll the dough to about 30cm square, spread with mustard, then with a generous spread of grated cheese and chopped ham. Roll up tightly, cut into a dozen sections, then lay these overlapping on a tray, in either a ring or two strips. Cover and leave for an hour to 90 minutes to rise, then bake at 240C (220C fan-assisted)/465F/gas mark 9 for 25-30 minutes, until golden and bubbling. You will need a muffin tin, buttered, for this. The recipe supposedly makes 24 but I didn’t get that many out of it; perhaps practice makes perfect. Add the remaining syrup, melted butter, egg and salt to the yeast liquid. Place the flour in a large bowl and make a well in the middle. Pour the liquid mixture into the well and gradually bring all the flour into the liquids, working the dough so that everything is mixed well together. Knead for 10 minutes, then put in a lightly buttered bowl, cover, and leave in a warm place to rise until tripled in volume. Henry doesn’t suggest how long but depending on how warm the room is, 1-2 hours should do it. Preheat the oven to 170C. Knock back the dough and roll it onto a lightly floured surface to make a rectangle 38x25cm. Brush the dough with the melted butter for the filling. Sprinkle with the cinnamon and brown sugar and drizzle over the maple syrup. Scatter the nuts and raisins on top. Roll up the dough like a rug, from the long side. Gently stretch the roll with your hands until it is about 60cm long. Cut the roll into 5cm cylinders and place each cylinder in a buttered muffin tin. Bake in the preheated oven for 30 minutes – but check earlier because, as I said, mine were a bit too hard. When removing the buns from the oven, tip the muffin tins upside down onto a cooling rack over a roasting tin so that the excess melted sugar can be rescued – scoop it up and spread it onto the buns as they cool. I didn’t do this because there wasn’t any excess left after baking. Thank you! I hardly got a look in at the savoury rolls as my boyfriend loved them.